Chuck – steak that is. Richard suggested I write some blog posts about all the different cuts of meat you get with a cow. If you ever buy a half or a quarter of beef, you get a lot of cuts that are not prime, supermarket or butcher cuts. This is not so say they are no good, not at all. In fact, one of my favourite cuts of all time, the flank (and skirt – its definitely a battle for prime position there) is one you don’t often see at the shops. Chuck is one of those less prime cuts. Cheap. Tasty. Chuck is one of my favourite winter eating cuts of beef. It comes from the shoulder area in the front quarter, high up, between the bottom of the neck and the start of the rib cavity. 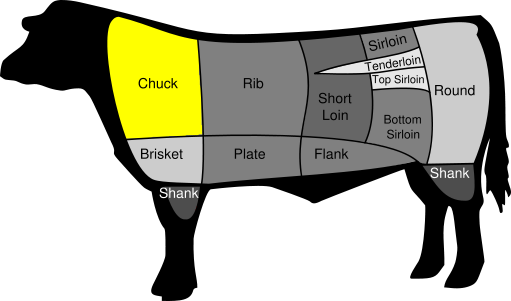 Chuck can be a tough cut, but, as is generally the rule with beef, I find, the tougher – the tastier. Chuck is high in fat. This is a good thing. It also has a lot of connective tissue, hence the toughness. This connective tissue needs slow, long cooking, to melt. This adds a delicious moistness to the meat. This tough, fatty, connective tissue filled cut often ends up as mince – and it does make good tasty mince. Makes good, juicy, tasty burgers. Mmmm. However it is fantastic as a filling for a steak pie, or as a pot roast. I sometimes cook this one night, eat some with mash and vegies as a casserole, then the next day make the pies with the leftover cooled filling. 1.5kgs Beef chuck, in large (2 – 3cm) dice. 1 teaspoon salt, 1/2 teaspoon cracked pepper, 1/4 cup of plain flour. Toss the beef cubes in the flour and salt and pepper. Fry off in a large saucepan in a good splash of Olive oil. 1 whole garlic bulb, peeled, roughly chopped. 2 tablespoons fresh herbs (or 1 teaspoon dried) I use Thyme, Oregano, Parsely. enough water or beef or vegetable stock to cover. Bring to a simmer for ten minutes. Bung this in the oven for 2 hours or more at 160 degrees. Or leave simmering at a very low heat on the stovetop, stirring occasionally. Longer cooking time is also good, as long as you check there is enough liquid to just barely cover it all from time to time. If you have a pressure cooker, then pop it in there for 35-40 minutes. If you want more vegies in your pie, add in a couple of diced potatoes, sweet potatoes, mushrooms, or whatever else you like, then put back in the oven for the last hour of cooking. Ensure there is still enough liquid to just cover. For individual pastry topped pies, cut shapes of puff pastry to suit your serving pots, fill pots with pie filling, top with pastry, brush with beaten egg, and bake in a hot (190 degree) oven for ten minutes or until pastry is crisp and golden. For a complete crust filled pie, allow the filling to cool. Pie Pastry. This is a whole other series of blog posts, the right pastry for the right task is a complete joy to me. Lately I’ve turned to a lard based cornish pasty pastry as a pie base, with rough puff for the top. The pasty pastry is strong enough to hold all that filling, and the rough puff gives a fantastic, buttery flaky top. If you are making yourself a big batch to freeze up for quick and easy dinners or lunches, make both, for a superior result! Try Gordon Ramsay’s rough puff, and the Cornish Pasty Association recipe for pasty pastry. Hot water pastry also makes a decent pie crust. For a red wine version, Swap out the ale or beer for a half a bottle of red. Add in a couple of cups of mushrooms for the last hour of cooking for a beef and mushroom pie. Another interesting flavour boost is a few chunks of pancetta, added in when you fry off the celery, carrot and onion. Chuck suits pot roasting. Pot roasting is done in a heavy casserole, lid on, with liquid, in a warm steamy bath kind of method. Its a good stick in the oven just after lunch time and eat on Sunday evening kind of roast. Pot roasting leaves you with a juicy, tender, moist, melt in the mouth textured roast and a lovely rich gravy to go with it. I use a cast iron casserole dish. If you don’t have a casserole dish that is suitable for stovetop cooking as well as oven, then fry all your stuff off in a frypan, then place into the casserole dish ready for the oven. If you don’t have a casserole dish that has a tight fitting lid, then just cover it well with foil. 1 – 2kg piece of chuck roast. 2 cups red wine, 2 cups stock (or all stock if you prefer to jut drink the wine). Rub your hunk of beef generously with salt and pepper, pour a little oil into your casserole dish, and heat on the cooktop. Place in the meat, turning it to brown for a couple of minutes on all sides. Remove the meat. Add in the vegies and fry for about 5 minutes. Make a pile with the fried vegies in the middle of the pot, place the meat on top, and pour in the wine and stock. Add herbs if you choose, bayleaf, peppercorns, thyme are good. Place in a preheated oven at 160 degrees for 1.5 – 2 hours. Check the liquid level occasionally – don’t let it dry out, add more water if needed. If there is too much liquid, remove the lid for the last half hour of cooking. For a delicious gravy: After 2 hours, remove the meat and set aside in a warm spot, and strain the rest of the juices out of the cooking pot. Add enough water to make into 1.5 cups of liquid. In a small saucepan, whisk 2 tablespoons of cornflour with 1/4 cup of water, add in the liquid, and whisk/stir over heat until it comes to a low boil. Simmer for 3 minutes, then set aside to pour over your roast. Slice your tender juicy roast and enjoy with the luscious gravy! Note: left over roast slices frozen with gravy makes for a really good quick filling for hot roast beef and gravy rolls for lunches. Left over roast, shredded, and gravy, even with leftover chopped up roast vegies, also makes a great pie filling! This entry was posted in Beef, Food, Savoury and tagged beef cuts, chuck, pot roast, steak and ale pie. Bookmark the permalink. 3 Responses to Chuck – steak that is. Agree! We got half a cow in January. Still have the skirt, as have heard its delicious but I haven’t used it yet as don’t want to ruin it. Skirt and Flank are prime cuts for stir frying, and apparently much loved in Chinese cooking. I stir fry all the time though so tend to use round or topside for this. I like skirt or flanks as a steak – fairly rare, anywhere past medium rare they are going to be chewy. I tend to salt & pepper mine reasonably well, a little olive oil, and then BBQ on coals for a few minutes each side, a little rest, then slice it across the grain to serve, just as for any other steak but pre-sliced. Goes well in a thai beef salad like this too, or topping any salad as a summer dish. I remember just having the flank alongside a warm kipfler potato and broad bean salad with pancetta, that was particularly good! I’ve also done it on the BBQ similarly, with a bit of a mexican spices rubbed in and let to marinate (oregano, paprika, chili, cumin, coriander, garlic, squeeze of lemon) cooked as above and served with homemade tortillas, and BBQ tomatoes, capsiums, onions.